"When I'm down it's almost like he can sense it ... He has climbed into my bed with me." When Wally was just a tiny baby alligator, nobody wanted him. 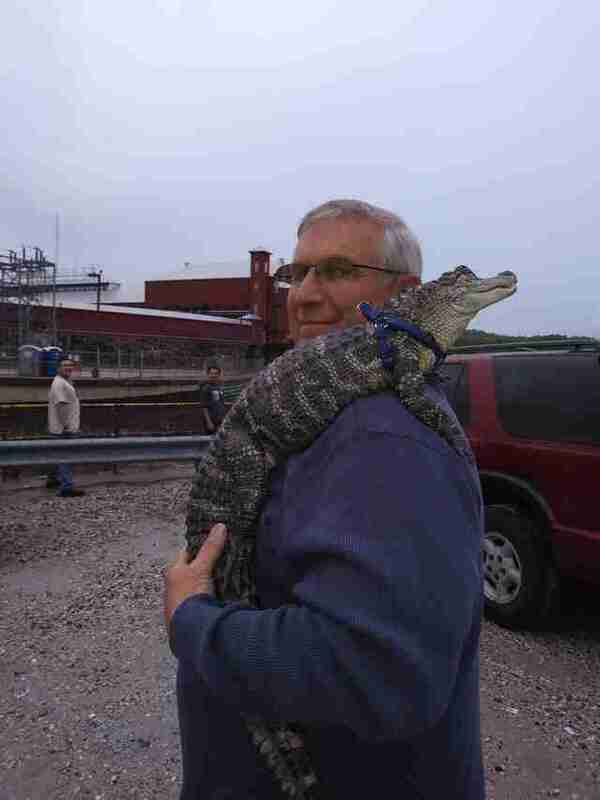 In fact, people were afraid of him and the other alligators like him. Wally was part of a population of alligators living around Orlando, Florida, a city that attracts so many child tourists. 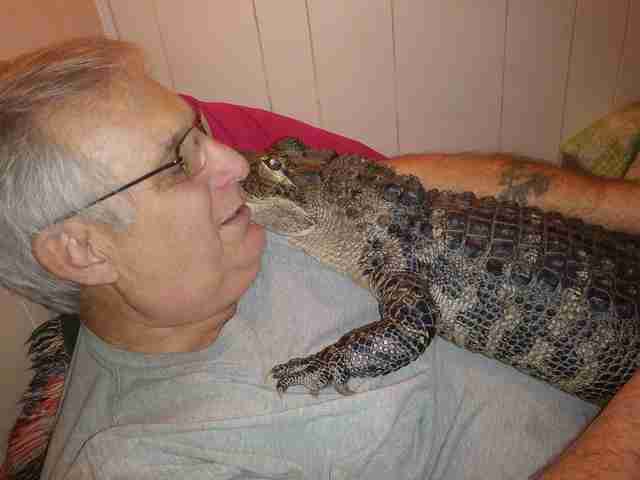 People were worried that animals like Wally would become too dangerous to coexist with people. "If I wouldn't have taken him he would have been killed," Joie Henney told The Dodo. Wally was just over a year old when a friend of Henney's rescued the little guy, and then Henney offered Wally a home in York Haven, Pennsylvania. So Wally's life was saved. And, as it would turn out, Wally would also rescue his rescuer. Henney was struggling with depression and his doctor suggested he start taking pills. But Henney noticed that he felt so much better when he was spending time with Wally. "When I came home and was around him, it was all OK," Henney told The Inquirer. "My doctor knew about Wally and figured it works, so why not?" 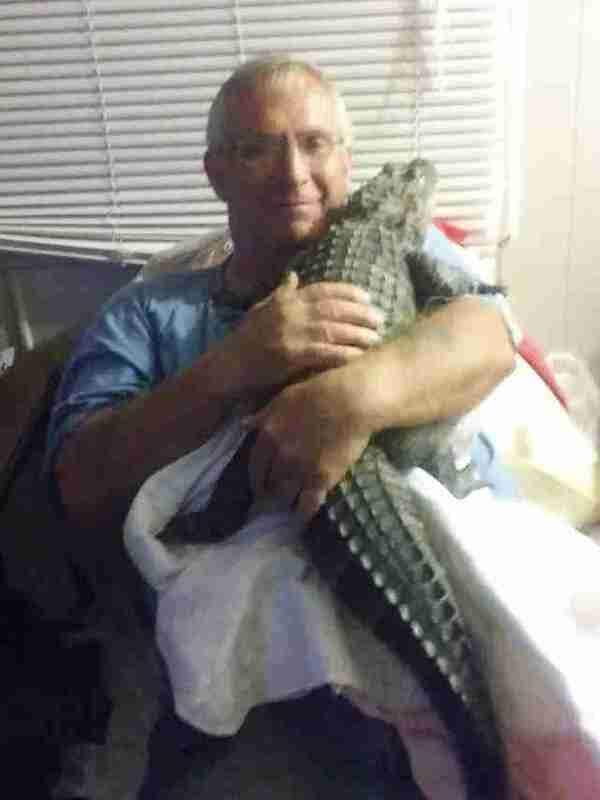 That's how Wally helped to rescue Henney — and the nearly 4-year-old alligator officially became registered as an emotional support animal. 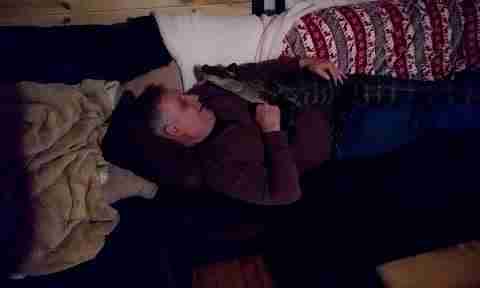 Wally is now about 5 feet long, but still cuddles up with Henney on the couch. "He likes to give hugs," Henney said. Henney is sensitive to the fact that most people don't realize how personable and loving Wally can be, so Henney doesn't take his emotional support animal everywhere — just to the places he knows Wally will be welcome. "Before I even had him registered as an emotional support animal I did take him around with me to stores, walks in the park and had meet-and-greets with him," Henney said. Wally recently cheered up the residents at a local nursing home, hugs abounding. "He helps me keep my spirits up," Henney said. "When I'm down it's almost like he can sense it ... He will come over to me on his own. He also has climbed into my bed with me when I'm not feeling well." Wally could grow to be 14 feet long — but he'll have a home forever with Henney, who is building a special facility for him starting this summer, so he'll have room to grow. Wally already has a pond, which he shares with another rescued gator, a 2-year-old named Scrappy. There's also Luna, who at 8 months old is the youngest rescue. "Scrappy is still kinda small and Luna still likes to run [around]," Henney said. "It's Wally [who] gives the hugs." 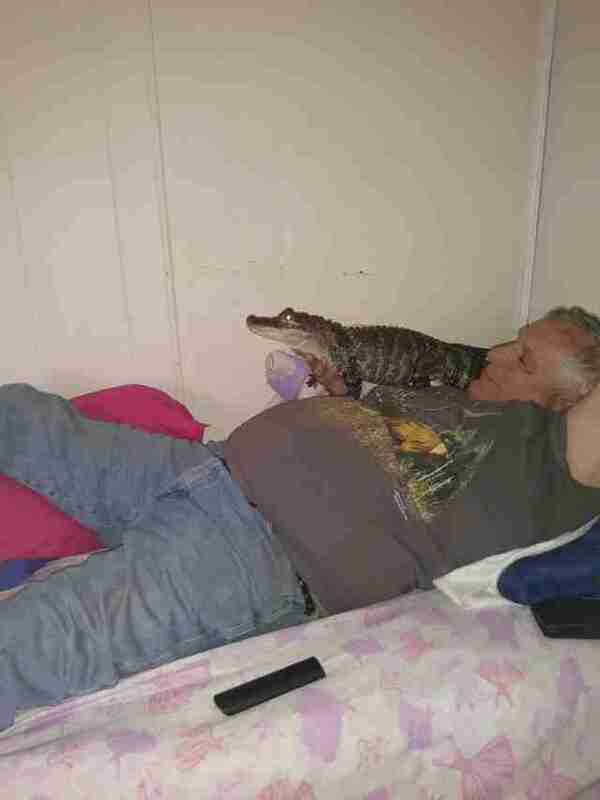 While gators don't usually make good pets, they're often removed from or killed in the wild since they live near people. To help protect gators in the wild, you can make a donation to Defenders of Wildlife.